I first wrote about the potential health benefits of Omega-3’s found in fish oil back in 2013 when we had just started to supplement the dogs’ diets with it. We originally were looking for the skin and coat benefits it could provide through the winter, but we saw our senior beagle Kobi start feeling better in other ways too. He was spunkier and felt better than he had in quite a while. Disclosure – This post is sponsored by OmegaBrite, but Wag ‘n Woof Pets only shares about products we have tried and believe will be of interest to our readers. All opinions are our own. We continued to use it, and it was one of the important ingredients in our golden retriever Sheba’s cancer diet as well. We’ve used some different brands and varieties over the years, most formulated only for dogs, but when asked if we’d like to try OmegaBrite, I learned something new. OmegaBrite is not just for dogs, it can be for cats and humans as well. It had never occurred to me that one product like that could benefit our whole family! As always when considering new products for the K9 Crew, I have some stipulations. I prefer all-natural products made by reputable companies with experience in their field. OmegaBrite is 100% natural and pharmaceutical quality. It was formulated by a Harvard educated practicing physician 15 years ago, who had a goal to create a highly concentrated pure omega-3 supplement. I appreciate that they use only small fish from the cold, clean waters of Peru and Chile, and that their product is tested by a third-party laboratory before, during, and after production. OmegaBrite has also been independently tested by ConsumerLabs, and won their independent seal of approval by exceeding their highest standards for purity, potency, and accurate label claims. It is also 100% guaranteed, a sure sign that a company believes in their product. Keeping these two active, healthy, and happy is a high priority for us. Now that I’ve settled that, what are the potential benefits of fish oil for your pets, that keeps it as one of our favorite supplements in Luke and Cricket’s diets? EPA, one of the two Omega-3 fatty acids in OmegaBrite, has anti-inflammatory benefits. That means it can help with conditions of the heart, kidneys, skin and joints. Since Cricket has both arthritis and an enlarged heart, and Luke has luxating patellas in both of his back knees, this is the key benefit for us. With winter approaching, and two very active dogs, this is the time of year we want to be sure their joints are in the best shape they can be. Both dogs have been doing quite well with their joint issues, and I believe that Omega-3 supplements are one of the factors contributing to that. We keep them lightly active to help their joints stay loose, and both dogs take other supplements as well. Senior Cricket also takes medication. We believe in doing everything we can to keep them active and happy. Our beagle Cricket lives to play fetch with her ball. OmegaBrite can help promote a healthy skin and coat along with reducing shedding. It can ease inflammation due to allergies, reduce dry skin and dandruff, and can potentially reduce the incidence of hot spots. This can also mean less hairballs in cats! Both of our dogs have soft and shiny coats, and I believe fish oil is helping with that. DHA, the other Omega-3 fatty acid in OmegaBrite, is important in brain and eye development in puppies and kittens. It can be given to pregnant or nursing pets to benefit the babies. Though results are still inconclusive, in some studies fish oil has slowed the growth of cancer, therefore it is recommended by some veterinarians for pets with cancer. It was an important facet of the dog cancer diet we had our golden retriever Sheba on (“Fighting K9 Cancer Through Healthy Living II”). There are not just anti-inflammatory effects, but may be immune system benefits as well. It’s of note that the concentrations of EPA and DHA in OmegaBrite are well above what is recommended in the diet we followed. Jumping is a fun part of playing fetch, but we do try to limit it to avoid extra stress on their joints. We have been focused on the dogs with this new product, but I want to check with our cat Samantha’s vet as far as starting her on it. She does get hairballs, and her long fur is often matted. I’d love to see a reduction in that! She’s on several medications, however, so we want to be sure this will be a safe addition for her. Years ago, my hubby and I took fish oil supplements as well. I think at that time there were a lot of questions about its benefits, and we stopped taking them at some point. After reading all the different benefits for humans on OmegaBrite’s website (click here to read for yourself), I believe we are going to start taking it again. I’m most interested in the benefits to our hearts, moods, and focus. It couldn’t be any easier to do so, when I can use this one product for our entire household! 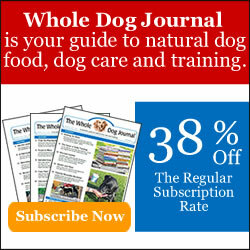 Does anyone in your household – human or pet – take Omega-3 supplements? I’m glad you’ve found something that is working so well. I’m constantly on the quest for the next thing to give my dogs some comfort. Question…do you use it with conjunction with the CBD oil? I have Sampson on that and wouldn’t like to take him off it. Yes, I use both the CBD oil and the fish oil with Luke. Cricket isn’t currently taking the CBD oil, since I haven’t been able to check with our vet to be sure that it’s OK with all of her heart meds. We get fish oil and eat a lot of tuna, salmon and sardines but Mom still likes to add omega 3 supplements. Sardines are a favorite of this crew too! Good catch, Cricket! I worry about jumping too. Of course, cats jump everywhere – but over time I’ve become more worried about the longer jumps affecting Bear or Ellie’s joints/causing inflammation. My bed is pretty far off the ground so I added a step – Bear refuses to use it of course. And Bear isn’t scared of jumping on counters or tables though I try to pick him up and set him on the floor instead of chasing him off. That might be counterproductive – but I feel better about it. I’d love to hear how things go with Sam if she takes the Omega-3. We had a spell a few years ago where Samantha couldn’t jump at all. They never did figure out what was going on, but all of the sudden, many months later, she could jump again! We get her joint supplements already, and I think the fish oil could help too. These days she doesn’t jump much, since she can’t really see, but I really cringe if she has a miss! We keep her food in a place she can just climb over furniture to get to. I don’t think you can be too careful, especially as Bear gets older. I briefly had Raven on fatty acid supplements and our vet mentioned that the veterinary formulas have a different ratio of fatty acids than the human formulations. Raven didn’t seem to tolerate fish oil so I can’t give her any. I’ve been surprised to read here that many cats don’t even like fish oil. I thought all cats liked all things fish, but apparently not. I’d definitely start Sam out slow with it, since she is SO picky. This sounds like a great product. The mom has tried added fish oil to our food but then we won’t eat it. She never understood why since us cats are supposed to like fish. That’s what I always thought too! But I remember the time Sam wasn’t feeling well and we couldn’t even entice her with tuna juice (she will drink it now though). That sounds good but we have never liked anything with a fish oil taste, go figure. The Dad keeps trying though. We all get fish oil in our breakfast, but Mom says she might stop that as she hates the fishy smell. She can’t imagine taking anything with fish herself no matter how it smells or tastes. It is supposed to be really healthy, though. Since this comes in caplets, there is no smell at all, so your Mom might want to try these!